The G7 Summit crumbles beneath Donald Trump’s feet, while the SCO Summit got bigger and better. Why not? Erstwhile geopolitical enemies, India and Pakistan, just got full memberships to the real gamechanger in the Eurasian continent and the world, the Shanghai Cooperation Organization, making the latter the largest grouping of countries pursuing multipolarity around the globe. The mood at the SCO Qingdao Summit was a very stark contrast to the contentious G7 meeting between Deep State controlled corporate governments. There were too many flagrant deviations by the US delegation from established etiquette to consider it a simple sign of Trump’s erratic boorishness. Instead, it appeared that American president was in no mood to compromise, and had every intention to aggravate. Arriving late to miss a face-to-face with Emmanuel Macron, snubbing Theresa May while leaking pointed comments about her “school mistress” tone, tardiness at the official breakfast on Saturday, and skipping a climate change discussion to leave early, only to give a casual press conference on the way out – all of these were extravagant diplomatic displays of disdain. While some have reported that Trump simply never wanted to go to Quebec, others believe he is following the well-known conflict strategy in negotiation, in which he scares his supposedly saner counterparts into granting him his wishes just to avoid the greater risks he is prepared to take. The only man with a counter-strategy to the man-with-the-bomb act appeared to be Emmanuel Macron who simply decided to death grip Donald Trump’s hand until it turned an alarming shade of white, though it remains uncertain if the move was effective. 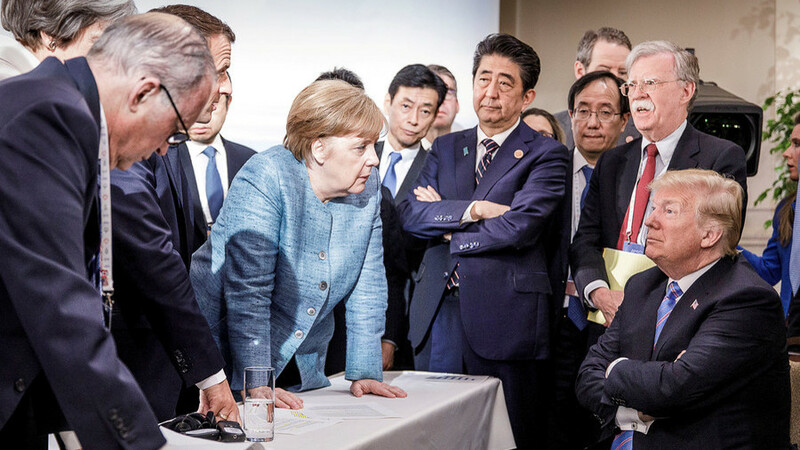 Painting the US as a victim of its haplessness – “the piggy bank that everybody is robbing” including a “brutal” EU – as a result of asymmetrical tariffs, Trump announced his aluminum and steel levies in advance of the G7, and didn’t let the topic go, only to turn around at the last moment and suddenly suggest dropping tariffs altogether. In one of the mostly tonally odd moments of the entire summit, Trump at one point announced out of nowhere – in a mix between a deadpan joke and a power move – that Canada had agreed to drop all tariffs, with Justin Trudeau standing next to him bemused (“we have a ten out of ten relationship,” Trump told the media). Add to that is his trashing of the Iran Deal, the US Embassy move into Jerusalem, the recent US-UK-France bombing on Syria that was based on false “chemical attack” pretext and the continuing military support for Saudi Arabia in the latter’s genocidal operation in Yemen, all of which do not promote peace in the Middle East. Whatever the case may be, it is very evident that it is still hard to deal with Western governments that continue to engage in doublespeak within themselves and against their Asian counterparts. Even the Philippines have already allowed the “refueling” of a Chinese warplane in the country. This has never happened before. “The request for landing was received, processed and cleared by relevant Philippine Government agencies. The landing was requested for the specific purpose of refueling and was granted and given with specific conditions for compliance by the requesting party,” Duterte’s assistant said in a statement. Philippine Air Force (PAF) Tactical Operations Group commanded, Lt. Col. Ritchie Pabilonia, said the request for landing was arranged by the Chinese attaché in Manila. With Russia out, none of the BRICS countries were represented at Charlevoix, and economic data shows that with each annual summit the share of the seven keeps falling in relative terms, as the rest of the world catches up. But libertarian economist Jeffrey Tucker believes the problems run deeper than that. Nevertheless, the Trumpian adventure continues in Singapore as the US president is slated to meet with North Korea’s Kim Jong Un to give his blessings to the Korean Reunification. Another Nobel Peace prize is on the way. If you think both sides are just playing with all of us, then let’s do something by ourselves. One way of defeating the Deep State is to bring down Big Pharma. Here’s how you do it. Previous PostWhy Venezuela and Syria Cannot FallNext PostWho Murdered Chef Anthony Bourdain? So NOW we will SEE the so-called “Plan B” of the NWO attempt to happen trying to LOOK like something different in another effort to FOOL us again…Won’t work either folks because “Magnetic Energy” will SHUT-IT-DOWN…SOON! Just the very type of stuff I found doing research on EVERYTHING …THANKS for the additional link too! Old Mao was easily turned by the Rottenfeller clan a LONG time ago, and even BRAGGED about how WELL he ran his country, calling it (Communism!) a model for the whole world to follow. Mao wasn’r a really educated man and was easily “Steered” by the bankoholics ALL the time he ruled…down to THIS day. Western Fascism is just another side of the same coin as Communism, BOTH “Corporate Owned” by the VATICAN! All Power to the Goddess!